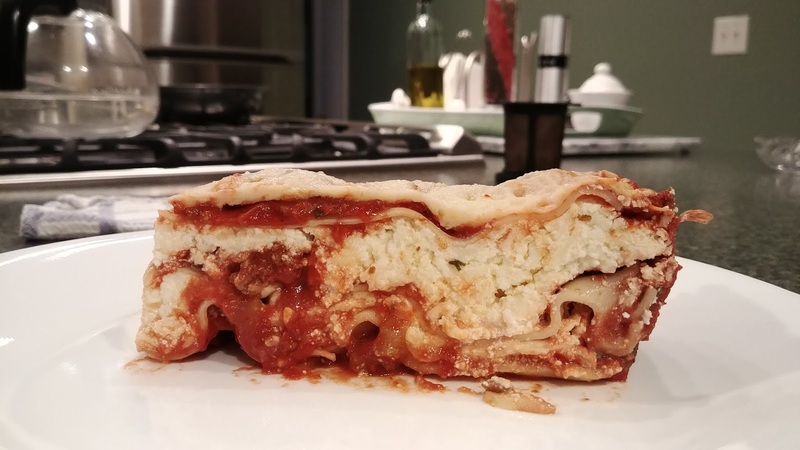 We've made lasagna a lot over the years but I don't see it on the recipe page. 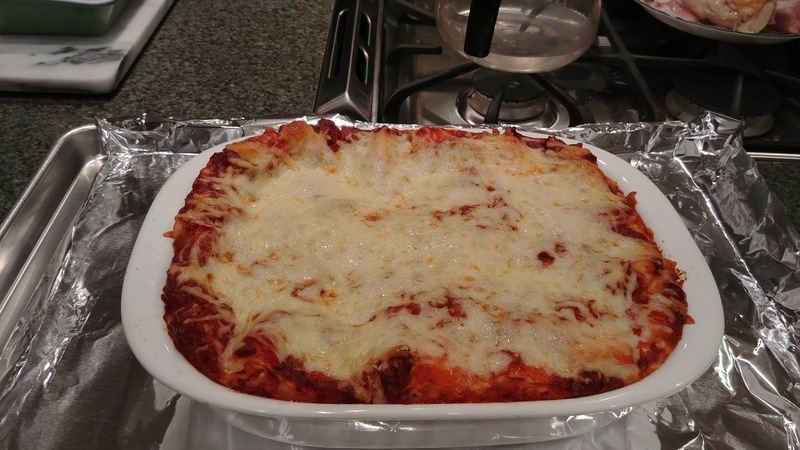 So here's a lasagna post! 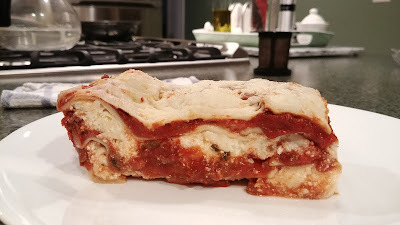 We made it back in February and were able to freeze a few servings for quick dinners. Step 1 is the sauce. 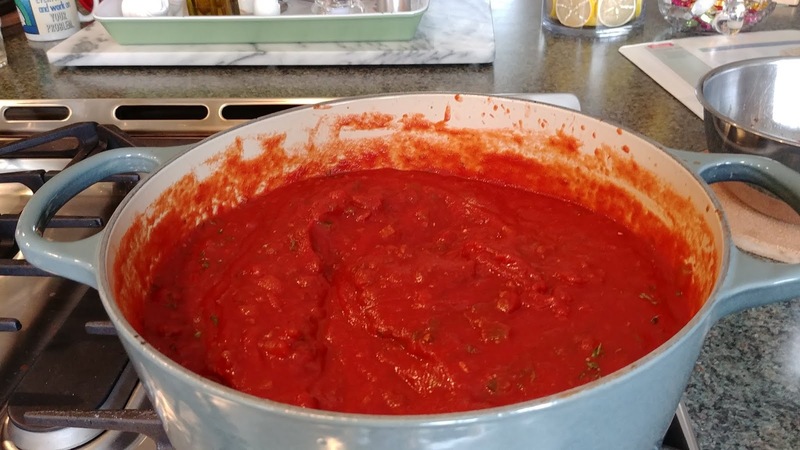 We made my mom's sauce. 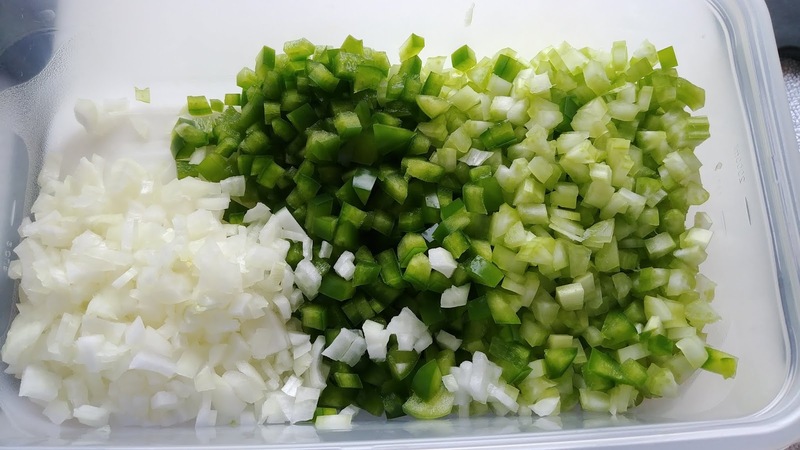 I chopped onion, celery, and green pepper. 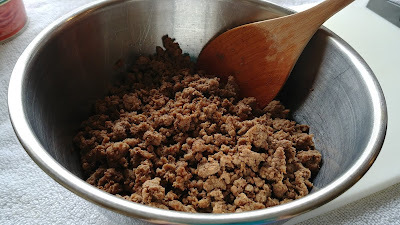 Meanwhile SP browned the ground meat. He drained the meat and wiped out the skillet before sauteing the vegetables and then adding the other ingredients. 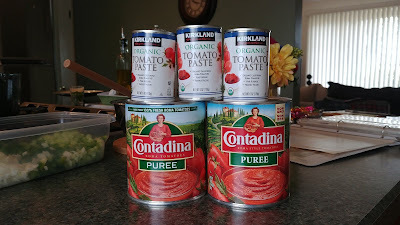 Not just tomato puree and paste but also Worcestershire, brown sugar, parsley, oregano, and black pepper. It simmered for a few hours in our Dutch oven (any large pot will work). Step 2: combine ricotta, mozzarella, and egg for the cheese layer. Step 3: Cook the lasagna noodles. Step 4: Create the lasagna. 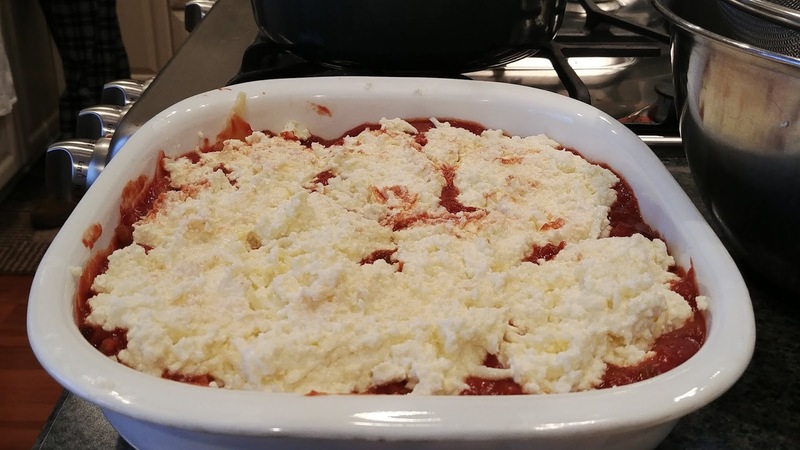 Top the lasagna with more shredded mozzarella and shredded parmesan. Bake at 350 for an hour or until bubbly and cheese is browned. Let it cool 10-15 minutes before slicing and serving. 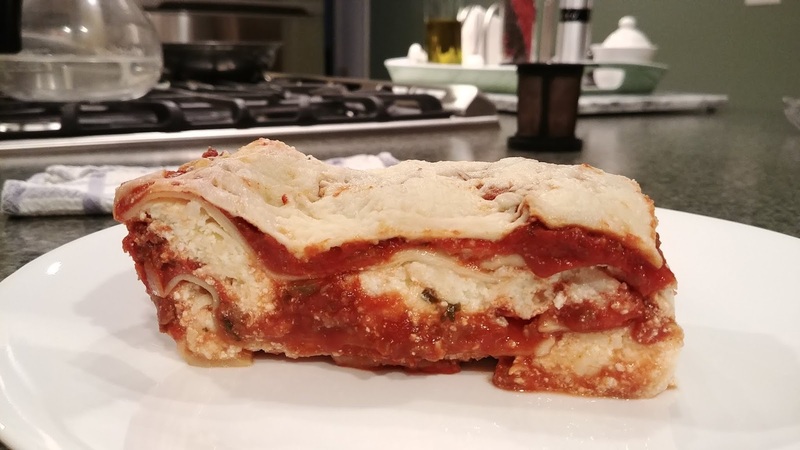 Lasagna is one of my favorite meals. Maybe my favorite. Especially my mom's lasagna. It's cheesy and saucy and so darn delicious and comforting. Brown the ground meat in a large pot. Remove meat to drain and clean grease from pot. Add olive oil and saute vegetables in olive oil until softened. Add the puree, paste, brown sugar, Worcestershire, parsley, oregano, and pepper. Add browned meat. Stir well. Add a bit of water if sauce is too thick. Simmer for 4-5 hours, stirring occasionally. Combine in bowl and set aside. The cheese mixture can be mixed together ahead of lasagna assembly time, just refrigerate until ready to assemble. Cook 10-11 noodles (about 3 noodles per noodle layer (9 total) plus 1 or 2 for breakage or to fill in any gaps). Drain and spread out on cookie sheet. Use a 13 x 9 casserole dish. Ladle enough sauce into the bottom to cover the bottom of the casserole. Fit about 3 noodles on top the sauce layer. 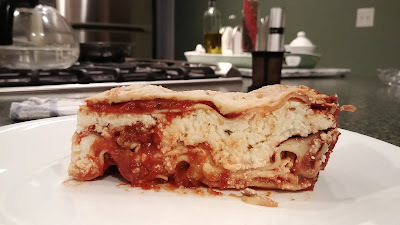 Top with half the ricotta-mozzarella-egg mixture. Use 3 more noodles and fit them on top the cheese layer. If the noodles don't fit quite right, you can trim them or cut off bits of a spare cooked noodle to fill in any noodle gaps. 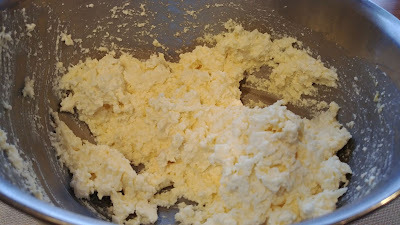 Top with the other half of the ricotta-mozzarella-egg mixture. Top with the final & third layer of noodles. Sprinkle with grated mozzarella and/or parmesan. Place lasagna on foil lined baking sheet (just in case it bubbles over). 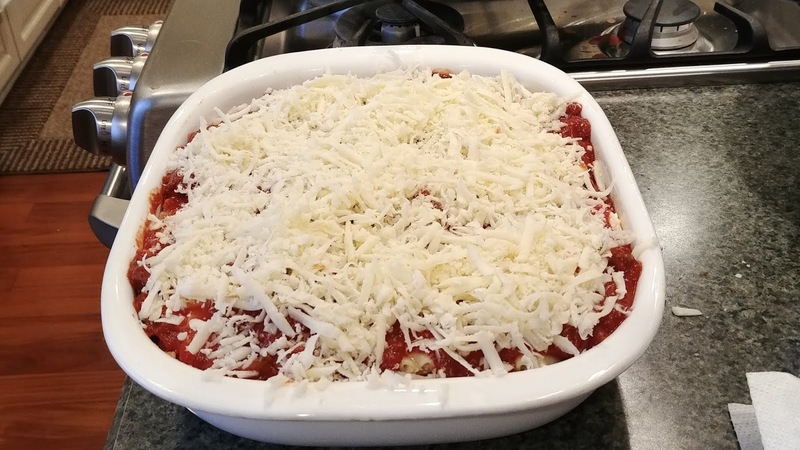 Bake at 350 for an hour or until bubbly and the top cheese layer is browned. Let it rest for 10-15 minutes before slicing and serving. *You might have leftover sauce which you can freeze.